Although spinning for small brook, brown and rainbow trout can be a lot of fun targeting large lake trout from a boat is how you'll hook that monster fish of a lifetime. The best lake trout lures are purpose built and designed for running deep and attracting predatory laker's even in low light conditions. Your two options are either trolling or jigging, with trolling being the most popular. Jigging can be great for really targeting fish in a precise location and depth. It is trolling however the really allows you to cover a lot water and target different drop off's and contours. You don't need a large selection of different lures to be successful but getting the sizes right and having a decent range of colors available is probably more important. Lake trout trolling lures all work as either attractors​ or imitators. Their action and vibration combined with the reflective qualities of their finish is what will force a trout to strike. The best trout lures for lakes are always going to have a life like swim action. The lures selected below will all give out a distinctive wobble or action that will help lake trout to hone in on your lures. Trolling spoons are probably the oldest and most reliable way to hook a lake trout. They have been around for decades. Originally spoons would just have been a piece of crudely shaped copper with a single hook. However they have evolved over time and that simple shape has now been refined in to hundreds of different actions. Materials have also moved on and you will find that modern spoons have super strong treble hooks and the main body can have a lot of different textures hammered into the metal, giving a very realistic scale like appearance. Spoons are best trolled slow. When lake trout are staying deep in the water column and ignoring other lures the wobble of a slow moving spoon can be enough to tempt them to strike. The classic Rapala is responsible for taking huge numbers of trophy lake trout. It has a hand tuned action that is super realistic. Available in both floating, neutral and sinking varieties. They also have a large range of sizes. The size you choose should really be determined be the depth and size of the fish you are targeting. For example you wouldn't really want to troll with anything smaller than a #7 on a lake unless you are targeting fish that are really close to shallows. They do tend to run shallow due to their slim profile and non-aggressive lip. So you have a choice of using a downrigger, lead core line or added weight on your line to get them to the required depth. Although they have an incredibly odd look and shape the Flatfish lure from Worden's has a very effective swim action. If you run one of these lures right below the surface you can see just how strong a wake they generate from their very pronounced action. There is a massive variety of colors available which also includes many different patterns. Lot's of fishermen will swear by one or two colors and what works in one lake may fail to produce in another. So color selection really will come down to combining local knowledge combined with water conditions/weather. Trolling speed can have a big impact on how the Flatfish will swim. At a certain speed the Flatfish will actually lose it's intended action and just start to roll over and over. The best approach is to tune the lure and the boat speed before you let out your line fully. Although some people may include the Rapala's mentioned above under the category of a jerkbait I tend to keep them separate. A jerkbait in my mind has a much more pronounced action than a stickbait like a Rapala. Jerbaits will usually have a fatter body profile and will normally have a more aggressive lip. The more aggressive diving lip will give them a much more noticeable action than a slimmer lure. These lures unless used in really large sizes and trolled at a high speed will tend to run to shallow or a medium depth. A good option to get them down is to use lead core line. There are thousands of different colors, brands, shapes and sizes. You can get some really good looking natural patterns that will imitate the natural bait fish that lake trout will feed on. If you are fishing on the ice then a jig is one of the best options to catch a large lake trout. There are lots of different patterns and materials available. The classic marabou tailed jigs are used to imitate small subaquatic insects. A jig is usually worked off the bottom in small vertical movements. Although you can cast from the shore to try and catch a lake trout that has moved into shallower waters the best option to target the larger fish will always be either from a boat or in winter out on the ice. Lake trout will tend to stay deep in the summer as the water temperature rises in shallower waters. Trolling is probably the best way to cover a lot of water. You are best advised to invest in a quality fish finder that is mounted to your boat. A fish finder allows you to find drop off's and other under water structures where lake trout will tend to spend most of their time feeding. 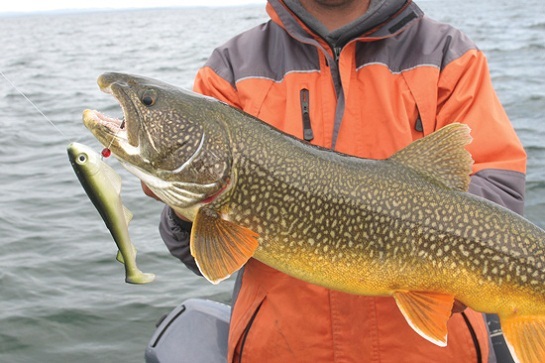 ​Different types of lures for lake trout will have a natural depth that the will get to depending on your boat speed. ​The options above allow you to fine tune and get the lures down deeper than they otherwise would.